We love sending our guest on little side trips in our area. We have lots of wineries and fun junk shops and of course great places to eat locally. But, there are those who love to drive the back roads and enjoy the beauty Texas has to offer in the “wild”. 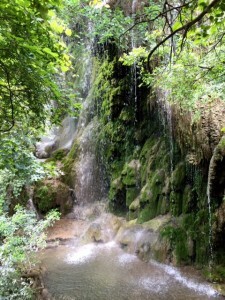 One of the most beautiful spots to go, Gorman Falls at Colorado Bend State Park. This glorious waterfall is about an hour drive and then a good 30 minute hike into the park. It’s not a hard hike, but you will have to do down to the falls on some rather large rocks. They have hand rails to help with the descent. I suggest you wear, good shoes and take a walking stick for extra support. Don & I just went this past week, it was a great June hike with the temp not too bad. But when we got down to the falls, it was worth every drop of sweat we shed. We have just had some great rain in the last month, so the falls was at it’s peak of beauty. I highly recommend that you pack a nice picnic and go down to stay for a few hours, there is a table there and benches to rest on. Some of the most beautiful parts of Texas are just around the corner from each of us, but we don’t take the time to go enjoy them. We do hope you will make the time to go and enjoy this great falls and then head on into the park and walk the Spicewood Springs. Visit them at Texas Parks and Wildlife website to see all they have to offer. 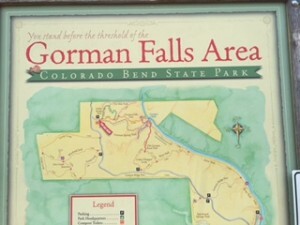 This entry was posted in General, Local Places and tagged Bend TX, Gorman Falls, hiking by admin. Bookmark the permalink.